John Deere’s new generation of fixed chamber round balers for 2017 includes the top of the range F441R model, which makes its UK show debut on the company’s stand at AgriScot 2016 on Wednesday November 16 (stand no. 184, Lowland Hall). The F441R premium model has been developed to meet the high-capacity requirements of contractors and larger livestock farms. Like all F441 Series models it features a wider bale chamber, up from 1.17 to 1.21m, which automatically translates into an increased bale weight, and it also incorporates an extra 18th roller. The baler offers a choice of 2m or optional 2.2m pick-ups feeding a high capacity MaxiCut HC rotor with 13 or 25 knives. 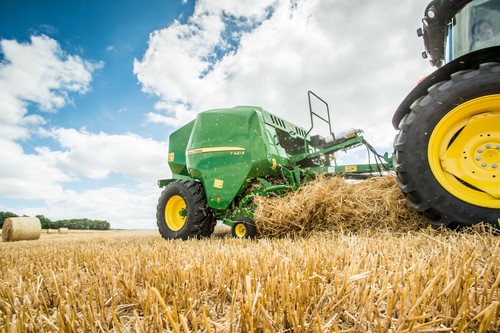 In benefiting from these improvements, the new John Deere F441R baler can increase productivity by up to nine per cent compared to the previous model, which equates to an additional five bales per hour. A 6130R tractor is also being shown at AgriScot, equipped with the new B-post door option. This split door design was available on older John Deere 30 Series tractors and has been reintroduced due to customer demand for a smaller door, to make it easier for livestock farmers in particular, who are moving in and out of the tractor cab all day.